Sunderland midfielder Lynden Gooch claims the Black Cats' belief that they're the best side in League One was the catalyst behind their comeback at Walsall on Saturday. Jack Ross' side trailed the Saddlers 2-0 with half an hour remaining, following Max Power's straight red card on 22 minutes. However, they rescued a point thanks to goals from Aiden McGeady (62) and Gooch's last-minute leveller at the Bescot Stadium. The draw keeps Sunderland second in the table behind Pompey. But with Kenny Jackett's side defeating Scunthorpe 2-1 at Glanford Park, the Blues have now opened up a four-point advantage at the top of the table. 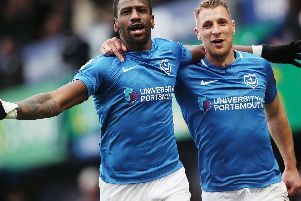 Pompey have the chance to extend their lead further when they play host to Walsall at Fratton Park tomorrow night, with the Black Cats entertaining third-placed Barnsley (both 7.45pm kick-offs). Yet American Gooch believes the points difference matters little at the moment, with Sunderland the stand-out team in the division. 'We’re a really close group,' Gooch told Chroniclelive.co.uk after Saturday's game. 'You could see that at 2-0 down, we didn’t give up, kept pushing each other and got our reward. 'We have that belief that we’re the best team in the league. Sunderland host Barnsley tomorrow night with only two points separating the teams. Gooch said the Black Cats would be ready for the challenge presented by Daniel Standel's in-form side. 'We know they’ll challenge as well, they’re a tough side, so it’s a big game at home,' added the American.